Born and raised in the jungles and lumber camps of South America, Luis Brown was educated in the United States. He was granted a MS from the Wharton School of Finance. Offering unprecedented levels of services, facilities and comfort, Luis has been a pioneer in world-class Peacock Bass fishing since 1992. He knows the standards American anglers have come to expect, and he has the experience, the local connections and the backcountry savvy to provide an unparalleled fishing adventure. These permits restrict potentially damaging commercial fishing, greatly benefitting the Indian tribes by preserving land, waters and wildlife in these delicate ecosystems. River Plate conduct our trips according to the “zero footprint” principle. Guests spend very little time in the actual rainforests; instead, they’re either in the fishing boats or eating and resting in our floating cabins. Many of our products are biodegradable, and we carefully remove all garbage. Our goal is to leave no sign of our presence. 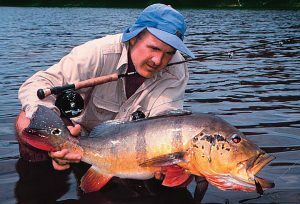 In 2001, River Plate began to sponsor the first long term official tagging project with the Amazon Research Institute, devoted to determining the impact of “catch and release” fishing on Peacock Bass populations. Well aware of our conservationist role, River Plate has partnered with Amazon authorities in the creation of preservation parks within the river basins of the Marmelos, Matupiri, Itapera, and Jufaris rivers. All together, these park comprise 3.5 millions acres. Between 1998 and 2003, River Plate distributed of 30 tons of food in some of these parks, in return for the curtailment of commercial fishing. River Plate has also donated a great deal of money over the years to pay for park wardens, and to build and maintain their outposts. In 1994, River Plate built a medical care facility for the County of Manicore, and in 1998 donated 20 acres of urban land to the town of Rorainopolis. The land was set aside for public housing projects for homeless jungle migrants. River Plate continues to provide food, services and monetary support to jungle communities and individuals who are in any way affected by its angling operations.